This past week I had one of the best backpacking trips of my life summiting Mt. Whitney. It was one of those trips that you come home from so tired that you can barely move, but so happy you can't seem to shake the grin from your face. The four of us (Zach, Luke, Tyler, and I) headed out early Wednesday morning from the Whitney Portal Campground. We were all a bit groggy from the lack of sleep, waking up from what seemed to be our "altitude adjusted overnight nap." Once we had our morning coffee, and our heads seemed to come back to us, we packed up and headed to the start of the trail. At the trail head we had to partake in the ritual pack-weighing and map-checking ceremony. We knew where we were going but we had to spot the stops we wanted to take, and to find out who would be hualing the most weight to the top. I won the weight competition, or lost, however you want to look at it. We had a fast paced up the trail but we definitely enjoyed the scenery. Our first stop was at Lone Pine Lake. We rounded the bend at about 4 miles in and found this beautiful mountain lake tucked away, we had to use it cool off. It was almost as soon as we dropped our packs that the Cliff Bars came out, and the shirts and socks came off. The fridged mountain water that was fed by snowmelt was calling us to jump in, soak our feet, and relax. Our second stop was beside a small mountain lake where the shade was drawing us in. We knew that our next leg was going to be mostly all uphill, through snow, and more challenging terrain so we decided to take another breather. Filling up on trail mix, bars, and dried fruit we found a nice little spot were we all got off our feet while trying to fight off the mosquitos that owned the area. Our next section of our hike was our last. We broke the tree line and into the alpine level of Mt. Whitney. The trail was practically all uphill and it was the first section where we really felt the altitude kick in and what it's like to "breathe through a straw." We traversed through snow covered trails and had to use our ice axes hoping we didn't have to self-arrest before we got to camp. 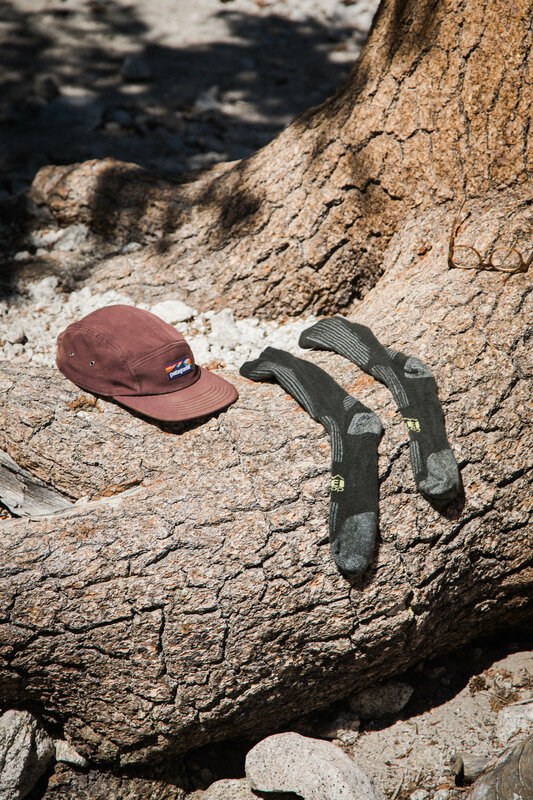 Once we arrived at Trail Camp we repeated the same pattern as before, drop the packs, take the socks off, ditch the shirts and jump into the water. This lake was a bit more shocking than the last though. With the water a cool greenish-blue tint, it still had chunks of ice and snow floating in its far corners. It was a bit more like an ice bath/therapy than it was refreshing and relaxing. We were all still feeling the pins and needles for about 10 minutes after we got out. As the afternoon went on we and posted our camp in a small alcove of rocks just adjacent to the main path. We sat in the small patch of shade cast by the campsite wall, relaxing and sipping coffee until the cool evening came. Once the evening arrived and the air cooled we threw on a few more layers and got our second wind. We decided to go explore the area before dinner. It was the perfect alpine night. The purple and orange skies held the horizon perfectly, highlighting the outline of the peaks surrounding us. We scrambled around the rocks, explored some rock fields and shooed off some scavenging mice before dinner. The next morning we woke at 4:30 knowing we were going to have to get some coffee in us and beat the days heat. We headed up to Trail Crest taking the traditional route of Mt. Whitney's 99 switchbacks. Once there, Tyler (because it was his birthday and he did what he wanted) shed the layers and did that last stretch to the top in his Speedo. He definitely caught quite a few looks trekking to the top in the high 30's weather. Arriving at the top we continued gaining attention by cracking some celebratory beers and lighting up some "we're on the highest mountain in the continental U.S." cigars. Zack and Luke did a "drop the pants" victory pose, and Tyler just hung out in his Speedo. All-the-while I was enjoying my cigar and beer, photographing the whole thing. That trip to the top of Mt. Whitney was one of the funnest few days I've had in a long time. I will always smile and laugh at the memories I have from my trip up to the top with those guys.